Dark Mode is a special form Riku can enter in Kingdom Hearts and Kingdom Hearts Chain of Memories. Riku initially receives the ability to enter Dark Mode from Maleficent, and he uses it against Sora after he reclaims the Keyblade. Riku loses it after his body is taken by Ansem. After entering Castle Oblivion, Ansem manipulates the darkness in Riku's heart, giving Riku the ability to use Dark Mode freely. 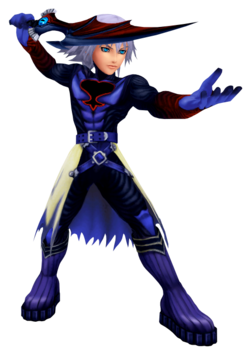 In this form, Riku can use his darkness without the worry of being taken over by Ansem. Since Riku has a strong affinity to darkness, this form gives him a substantial advantage in battle, such as increased speed and feeding the Soul Eater's unique power-up ability with the power of darkness. The Riku Replica can embrace the darkness willingly, thus he can also use and stay in Dark Mode. Vanitas, one of the main antagonists of Kingdom Hearts Birth by Sleep, as well as the Vanitas Remnant, wears a bodysuit similar to the one Riku wears while in Dark Mode. While under Vanitas's possession, Ventus also wears this suit. Riku wielding the Keyblade of heart under Ansem's possession. "The darkness will destroy you." —Riku upon entering Dark Mode for the first time. After coming into the service of Maleficent, Riku's heart began to be weakened by his continual use of the darkness, so the witch granted him power over it, allowing him to control Heartless and enter Dark Mode. Riku used this power to subdue Sora on Captain Hook's ship with his own shadow and fight off the Beast when he arrived at Hollow Bastion. When challenged later by Sora, he mocks him, entering Dark Mode for the first time. However, the strength of Sora's heart soared, his friends Donald and Goofy, and his weapon returned to him, which defeated Riku. Riku fled injured and severely weakened through a Corridor of Darkness back into the heart of the castle, where he reverted to his normal form. There, he met a hooded Ansem, who persuaded Riku to open his heart to darkness. The enigma possessed Riku, and used his body, now permanently in Dark Mode. In this mode, he created and wielded the Keyblade of heart, which he used to unlock Maleficent's true darkness. He waited and watched as Maleficent fell at Sora's hand, allowing Ansem to claim Kingdom Hearts as his own. All he needed was the heart of the last Princess of Heart, which resided within Sora. He attacked the Keyblade wielder, but was defeated. Riku used the last of his strength to fend off Ansem as Sora released his own heart to free Kairi's heart. Riku's heart and soul were forced into the Realm of Darkness, and Ansem took full control of his body. He entered the Door to Darkness to the End of the World, awaiting Sora. There, he did away with the form of Riku's Dark Mode, revealing his true appearance. From this point forward, Dark Mode was lost to Riku. "I know who I am!" —Riku in Dark Mode after battling Zexion, no longer fearing the darkness. Riku Replica entering Dark Mode. After his re-encounter with Ansem in Castle Oblivion, Ansem tampered with Riku's darkness, activating Dark Mode once again. Riku would utilize this form as he struggled in the card worlds. He would change into Dark Mode sparingly, a massive fear of the darkness manifesting in the depths of his heart, much to Ansem's displeasure. Later on, Vexen, Lexaeus, and Zexion, members of the Organization, wished to use the boy and his dark powers to halt the plans of the traitorous Marluxia. When Vexen challenged Riku, it was his immense power that led to the creation of the Riku Replica, an aggressive replica of Riku created by Vexen from the boy's combat data. Ansem seized the replica as an opportunity to use it as a model for Riku, urging him not to fear the dark like the fake. Eventually, Riku came before Lexaeus. A battle ensued between the two, Ansem possessing Riku's body in order to do away with the Nobody. Riku's sudden recollection of Ansem's control almost allowed Ansem complete control over his body. Were it not for King Mickey, Ansem's plan to get Riku back under his control would have succeeded. After the failures of both Vexen and Lexaeus, Zexion was forced to take action and tormented Riku with illusions in the Destiny Islands card world, taking on the guise of Sora and swallowing Riku in the light. It was here that Naminé appeared in the form of Kairi, teaching Riku not to fear the darkness and not to run from the light. Riku then regained himself, controlling and transforming into Dark Mode willingly in order to defeat Zexion. Riku no longer feared the darkness from this point forward. In the Twilight Town card world, Riku was approached by DiZ, the bandage-faced man telling him to seek out Naminé. He battled his replica a final time, meeting up with Naminé at last. She offered to put him to sleep so she could lock his heart, freeing him from Ansem and the consequences Ansem had on Riku's heart. Riku refused, needing his power to finish Ansem for himself. It was then Riku headed towards his final battle in Castle Oblivion to face Ansem for the last time. Afterwards, Dark Mode is never used by Riku again. Riku's Dark Mode was also shown in Roxas's dreams in the beginning of the game. Data-Riku is shown to be able to use Dark Mode after he is infected by the Bug Blox. In Kingdom Hearts Chain of Memories, when Riku activates this form, a blue aura surrounds him, he jumps into the air and shouts, "Darkness!". A bright blue light shoots out of his chest, and in a flash of light, his clothes transform into the same suit he wore while possessed by Ansem in Kingdom Hearts. This consists of a form-fitting suit that appears to be made of black muscle tissue. The black fades to red around the wrists and comes with purple gloves that are tucked under the suit. The suit has a purple-blue color on the chest and part of the torso with the Heartless emblem on the chest, but without the spiked bars crossing it. It has purple feet and shins that fade into black legs. It has a dark purple belt and a cloth around his waist, opening in the front. The cloth is an off-white color that fades into dark purple and is ripped all around at the bottom. In Kingdom Hearts Birth by Sleep, Vanitas's suit is colored in various shades of blacks and reds rather than blacks and violets, a distorted version of the Unversed insignia appearing on Vanitas's chest rather than the Heartless insignia-like emblem that appears on Riku's while in Dark Mode. The Vanitas Remnant uses the same suit, but it is black and white instead of black and red. In Kingdom Hearts Chain of Memories and Kingdom Hearts Re:Chain of Memories, since Riku is a playable character, he has a specific moveset while in Dark Mode. It should be noted that Dark Mode is only triggered when the player manages to fill up the Dark Points gauge up to 30 by breaking cards. Once Riku is in Dark Mode, he can stay in that state for as long as he has Dark Points remaining. He loses a certain amount of Dark Points if he receives damage, proportional to the amount of damage taken, or if his card is broken, with the number of Dark Points lost equal to the difference between the enemy's card and the broken card. For example, if an enemy breaks Riku's 2 card with a 9 card, Riku loses 7 DP. When his Dark Points reach zero, Riku reverts to his normal form. While in Dark Mode, Riku has increased speed, can utilize Sleights, and his Soul Eater reacts to the darkness, increasing in power. His three-hit combo has the power to stun with the second hit, flames bursting from the Soul Eater upon the combo finisher. Riku possesses an aerial spin-slash, also able to double-jump behind an enemy and dash in a similar fashion to Sora's Quick Run. While under the possession of Ansem, Riku has access to almost all of his dark powers, including a few new abilities such as a dark version of Strike Raid. Dark Impulse Knock foes into the air before a hard slam down to the ground, damaging multiple enemies. Only available in Dark Mode. (Re:CoM) Win a duel that requires you to break three cards. Dark Maelstrom Unleash a powerful spinning attack on the enemy. Damage is concentrated to one enemy. Only available in Dark Mode. (Re:CoM) Win a duel that requires you to break five cards. Dark Barrage Throw multiple Soul Eaters towards the enemy. Damage is concentrated to one enemy. Only available in Dark Mode. (Re:CoM) Win a duel that requires you to break seven cards. During the first battle with Riku's Dark Mode in Kingdom Hearts, he uses supreme agility to jump far distances, either away from or to the player's location. While the player is in close range, Riku will attempt a powerful spin-slash. He uses a single-hit slash which closes in far gaps, and he is also able to deal immense damage. Magic has no effect on Riku, so the player must rely solely on the Keyblade. Jars can be found on the sides of the battlefield which contain HP Balls and Hi-Potions. When tackling a possessed Riku, who wields Dark Mode to its maximum potential via Ansem, one must take extreme caution. Riku will dodge almost every hit, attacking with just as much speed. Guard and retaliate immediately afterwards. Depending on what attack is blocked, a certain number of Tech Points may be earned. Beware that when Riku's HP starts to dwindle, he summons the power of darkness to unleash a series of dangerous desperation attacks. Again, magic has no effect, the Keyblade and its abilities the player's only chance of survival. When fighting the Riku Replica in Kingdom Hearts Chain of Memories, it attacks in a fashion comprised of a two-hit combo that stuns on the second hit. It also uses a jump-attack that causes flames to burst from the Soul Eater. Over the series of four battles, the Riku Replica gains access to Sleights, each very powerful and threatening to the player's HP Bar. This page was last edited on 20 March 2019, at 14:49.